Computer engineers create innovative computer programs, machines and robots. They also work with hardware and software to ensure that our machines and computers runs with power and efficiency. Our increasingly computer-reliant world is creating job opportunities for graduates with computer engineering degrees. The National Center for Education Statistics reports that computer science and engineering degrees accounted for 9.8% of conferred degrees in 2015–2016; this is a 3.5% increase from the early 1970s. The U.S. Bureau of Labor Statistics (BLS) also reports that computer hardware engineers earn a median salary of $115,120. 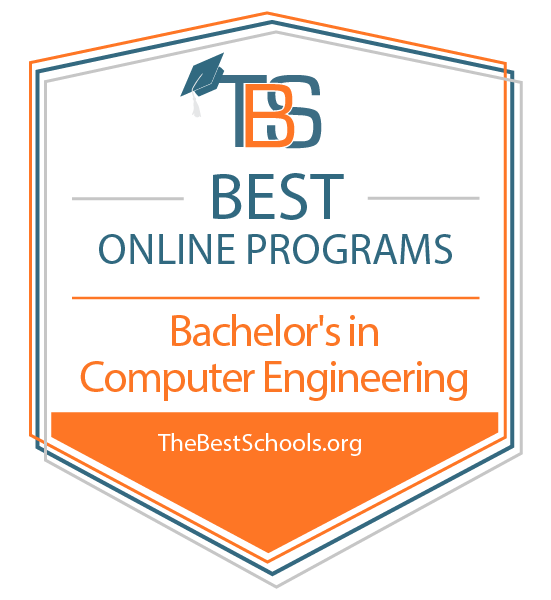 Because several types of degrees fall under the umbrella of “Bachelor’s in Computer Engineering” the following sections display top-ranked computer engineering programs as well as top-ranked programs from several related ranking articles on our website. To learn more about these different degrees, follow the link at the end of each section to their corresponding ranking article. What Else Can I Expect From an Online Bachelor’s in Computer Engineering Program? We selected the degree programs based on the quality of program and range of courses provided as well as school awards, rankings and reputation. Before becoming a separate institution, Old Dominion University was originally a division of the College of William and Mary. ODU is renowned for its doctoral and research programs as well as its variety of distance learning majors. The school offers distance learners a tuition rate that is only slightly higher than their in-state tuition rate. ODU currently offers an online computer engineering degree completion program that caters to students who already have an associate degree or a significant amount of credits. The 128-credit program allows students to transfer up to 98 credits. The program’s curriculum primarily consists of upper-level computer engineering courses, such as advanced circuit analysis as well as logic and microprocessors. Students must complete a senior project. The program also focuses on ethical engineering and engineering leadership. All ODU Online program courses are asynchronous and completely online. ODU is regionally accredited from the Southern Association of Colleges and Schools Commission on Colleges. Morgan State University is Maryland’s largest historically black college, and it originally opened as a private Bible college. Morgan State became a state school in 1975. Since then, it has continuously added majors and distance learning programs. Morgan State offers an online computer engineering degree program. This program is a 2+2 program, which allows students to complete two years of engineering courses at Morgan State and two years elsewhere. The 120-credit curriculum combines upper-level electrical and computer engineering coursework with general education requirements. Morgan State’s online division asynchronously delivers all coursework, so students are not required to visit campus. The school offers other services to online learners and working professionals by adhering to Quality Matters standards and allocating money for military tuition assistance. Morgan State provides library services, tutoring, tech support and academic and career counseling to all distance learners. Morgan State is regionally accredited from the Middle States Commission on Higher Education. Established in 1951, Grantham University is one of the oldest private distance education universities in the nation. The university’s College of Engineering and College of Arts & Sciences offers an array of undergraduate and graduate degree programs, which include its noteworthy online Computer Engineering Technology program. A variety of financial assistance is also available. There are no SAT, ACT, GMAT, GRE or standardized test requirements. Admission staff members guide applicants throughout the application process. Students can enroll in a degree program or on a class-by-class basis. Classes start weekly. Grantham University Online is nationally accredited by the Accrediting Commission of the Distance Education and Training Council. The University of Florida’s Department of Computer and Information Science and Engineering provides a variety of undergraduate and graduate programs. Housed in the Herbert Wertheim College of Engineering, the department serves traditional and non-traditional students through flexible online programs, internship and assistantship opportunities, scholarship opportunities, professional development services and a variety of labs and research centers; these include the Human-Experience Research Lab. The University of Florida is accredited by the Southern Association of Colleges and Schools Commission on Colleges. Oregon State University’s School of Electrical Engineering and Computer Sciences provides several undergraduate and graduate programs. The School of Electrical Engineering and Computer Sciences serves traditional and non-traditional students through online program options, numerous online resources, internship options and scholarship opportunities. Housed in the College of Engineering, the School promotes research programs like the Collaborative Robotics and Intelligence Institute and the Northwest Alliance for Computational Science and Engineering. Students combine expertise from their previous studies with their newfound knowledge, which opens up a diverse array of specialized job opportunities for them. These opportunities include jobs in systems analysis, computer programming and database administration. If you want more information about the best online computer science programs, then see the Best Online Bachelor’s in Computer Science Degree Programs. Through its famous World Campus, Pennsylvania State University offers an online software engineering degree . All degree requirements can be completed online with no on-campus obligations. The program gives students with a thorough understanding of software engineering by combining classroom learning with hands-on design projects. The BS in software engineering curriculum covers topics like principles of engineering, computing skills and software construction. Students also learn how to work with a team as well as develop their communication and problem-solving skills. Applicants with no previous college experience must have a high school diploma or GED to be accepted into the program. Transfer students need a minimum 2.7 GPA. Pennsylvania State University is regionally accredited by the Middle States Association of Colleges and Schools. The bachelor of science in software engineering program is separately accredited by the Engineering Commission of the Accreditation Board for Engineering and Technology (ABET). Online software engineering students are eligible for the same financial aid opportunities offered to on-campus students; this includes departmental scholarships. Eligibility is determined based on GPA in software engineering-related courses. Washington State University-Everett is regionally accredited by the Northwest Commission on Colleges and Universities (NWCCU). WSU’s software engineering program is going to apply for accreditation from the Engineering Accreditation Commission of the Accreditation Board for Engineering and Technology (ABET) as soon as the first students graduate from the program. If you want more information about the best online software engineering programs, then see the Best Online Bachelor’s in Software Engineering Degree Programs. A computer engineering online bachelor’s degree focuses on the intersection of technology and innovation. Students in these programs learn the essentials of hardware and software design. With an online computer engineering degree, graduates can pursue a career working with microprocessors, circuitry, programming, or applications. Computer engineering programs typically begin with a foundation in math, physics and chemistry. Core classes focus on topics like control systems, systems analysis, electromagnetics, databases and operating systems. Computer engineering programs usually focus on hardware or software. A hardware-centered engineering program will likely emphaszie electrical or communications engineering. A software-centered engineering program will likely emphasize computer and mathematical theory. These concentrations allow students to tailor their online computer engineering degree to fit both their interests and career goals. Most computer engineering programs require a capstone project. Many programs have students complete group projects or lab sessions. These projects require students to solve hardware or software problems by virtually collaborating with their peers. Students can complete many online computer engineering degrees entirely online. However, some programs are hybrid programs whcih may require learners to attend on-campus labs. While The details of an online computer engineering degree vary depending on the school or program, all curricula share some common characteristics. In the first two years, a computer engineering program should cover core topics, such as computer systems, electronic design and communications. As students progress through a program, they can tailor the curriculum to their interests with major courses and electives that build upon their career objectives. This introductory course explores the fundamentals of circuit theory. Students study the techniques and principles behind electrical circuit analysis and learn how to apply such laws as Ohm’s and Kirchhoff’s. Other topics include steady power, three phase and Fourier problems. In this online computer engineering degree course, students take an in-depth look at the software design process by using UML and object-oriented languages. Students in this course learn to critique the design process, a skill that enables them to detect problems at an earlier stage. ECE students must take a course in microprocessors. Students learn about electronic design and the role of microprocessors and microcontrollers. Standard topics include I/O, memory devices and microcomputer architecture. This advanced course covers digital design logic. Students explore topics such as combinational logic, machine design, timing, EDA and logic synthesis. This course may also introduce hardware languages such as VHDL. Almost every industry today relies on technology. To grow digitally, companies are hiring individuals with the ability to develop, build, fix and advance many different technologies. With an online computer engineering degree, graduates have the skills and knowledge needed to help enterprises conceptualize, innovate and lead. Hardware engineers oversee the entire computer hardware and peripheral production process; this includes the creation of processors, circuit boards and networks. Daily tasks may involve working on simultaneous projects. These project involve the whole production process, from designing to prototype testing. To enter this field, individuals should have a four-year degree in a relevant major. Like hardware engineers, electrical and electronics engineers also design, test and develop equipment. Electrical and electronics engineers deal with electrical systems, like those found in cars. Electrical and electronics engineers use the same skills and knowledge used by hardware engineers. With the integration of robotics, machine learning and smart technology, these two types of engineering significantly overlap. Software developers are in high demand. These developers create applications that drive hardware and machines. From coffee makers to a cars, more of our everday items require novel software. Software engineers work as developers who apply the principles of engineering to software design and creation. Software developers, however, do not usually possess the engineering skills to work as a software engineer.